The delay of BlackBerry 10 devices, which were supposed to come in the second half of 2012, sets up a cash flow concern going forward. Research in Motion said its first quarter would be bad. It turned out to be worse. And RIM will struggle more because the company said its BlackBerry 10 platform will slip into the first quarter of 2013. The BlackBerry maker reported a first quarter loss of $518 million, or 99 cents a share, on revenue of $2.8 billion, down 33 percent from $4.2 billion in the same quarter a year ago. Adjusted loss, which excludes goodwill charges, was $192 million, or 37 cents a share. Wall Street was expecting a loss of 4 cents a share on revenue of $3.07 billion. RIM had already issued a profit warning for the first quarter and analysts were expecting the worst. Meanwhile, RIM is cutting 5,000 workers and speeding up its cost cutting programs. However, the BlackBerry 10 delay may set in motion a worst case scenario. RIM's services business is profitable, but those profits could be gobbled up by a hardware money pit. Morgan Stanley analyst Ehud Gelblum earlier this week laid out a scenario where RIM would have to shrink dramatically to survive. Today, RIM has $2.2 billion in cash and equivalents, but that war chest could evaporate quickly the longer the company takes to deliver new products. 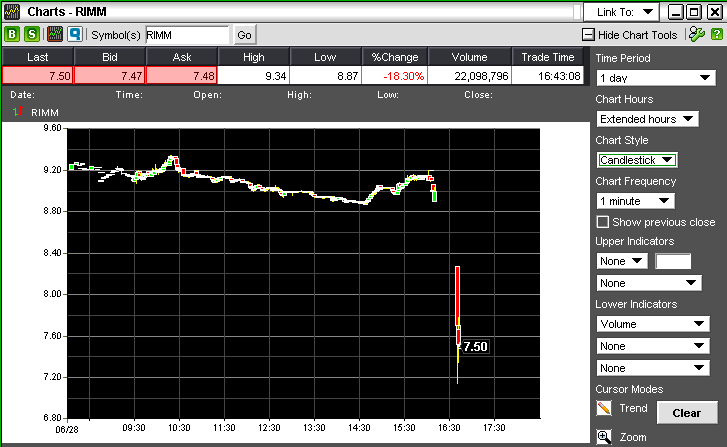 RIM shares fell more than 18 percent in afterhours trading. The company maintained that the BlackBerry 10 platform is its "number one priority." RIM's development teams are relentlessly focused on ensuring the quality and reliability of the platform and I will not compromise the product by delivering it before it is ready. I am confident that the first BlackBerry 10 smartphones will provide a ground-breaking next generation smartphone user experience. "I want to assure you we are not standing still." RIM's new Curve devices are being rolled out internationally. RIM did grow its subscriber base. New PlayBooks are in the final stage of testing and will launch "in the near future." The company's developers have been overwhelmed by an immense amount of code that needs to be commercial grade. Customers prefer a first quarter launch for BlackBerry 10 devices. BlackBerry 10 will focus on the low-end of the market too and have QWERTY handsets. RIM will also explore licensing BlackBerry 10. RIM's challenge is that there will be new phones from Apple, Samsung, Nokia and a bevy of others to worry about by time BlackBerry 10 devices hit the market. As for the outlook, RIM said it "expects the next several quarters to continue to be very challenging for its business based on the increasing competitive environment, lower handset volumes, potential financial and other impacts from the delay of BlackBerry 10, pressure to reduce RIM's monthly infrastructure access fees, and the company's plans to continue to aggressively drive sales of BlackBerry 7 handheld devices." In other words, RIM will see an operating loss in the second quarter. Wall Street is currently expecting RIM to report a loss of 6 cents a share on revenue of $2.84 billion and then turning a profit in the third and fourth fiscal quarters. Those estimates are likely to be cut dramatically. RIM added that it is rolling out its cost savings plan, which includes outsourcing as well as layoffs. Given the BlackBerry 10 delay, RIM said it may "increase the scope and magnitude of these programs." Specifically, RIM plans to outsource its repair operations, cut management, streamline its supply chain and cut 5,000 workers by the end of the fiscal year. Those moves are considered to be minimum requirements. RIM shipped 7.8 million BlackBerry smartphones. It shipped 260,000 PlayBook tablets. RIM's App World store has more than 89,000 applications. Subscribers at the end of the quarter checked in at 78 million.